The commemorative USSR stamps issued between 1929 and 1931 honored important contemporary events and anniversaries. 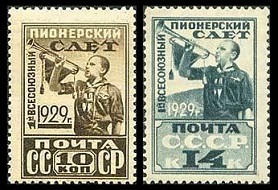 The two commemorative USSR stamps shown above were issued on August 18, 1929 to publicize the First All-Soviet Assembly of Pioneers. The designs feature a Bugler Sounding Assembly. 10 K. (1929 - Sc. #411) - Olive Brown. 14 K. (1929 - Sc. #412) - Slate. 10 K. (1929 - Sc. #411a) - Olive Brown. 10 K. (1929 - Sc. #411b) - Olive Brown. 14 K. (1929 - Sc. #412a) - Slate. The Vladimir Lenin All-Union Pioneer Association was a Communist youth organization for children between the ages of 10 to 15. Similar to the Scouting organizations of the Western World, children learned social skills and attended publicly funded Summer camps. Pioneer Palaces were built, which served as community centers, providing education and athletic events. Founded in 1922, the Pioneer Association had grown to two million members by 1926. 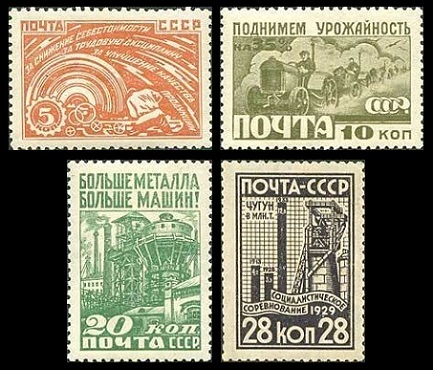 The four pictorial USSR stamps shown above were issued in November 1929 as publicity for greater industrial production. 05 K. - Allegory of industry. 10 K. - Tractors coming off the assembly line. 20 K. - Iron furnace, with inscription "MORE METAL MORE MACHINES". 28 K. - Blast furnace and chart of anticipated iron production. 05 K. (1929 - Sc. #427) - Orange Brown. 10 K. (1929 - Sc. #428) - Olive Green. 20 K. (1929 - Sc. #429) - Dull Green. 28 K. (1929 - Sc. #430) - Violet Black. 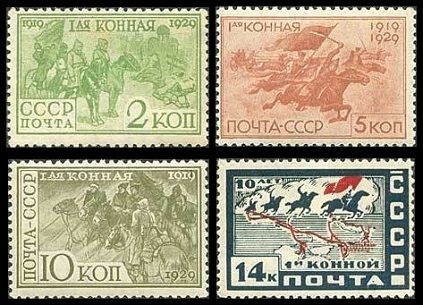 The four commemorative USSR stamps shown above were issued in February 1930 to celebrate the 10th Anniversary of the Red Army 1st Calvary. 02 K. - Red Calvary in a Polish town after a battle. 05 K. - Calvary charge. 10 K. - Staff Officers of the 1st Calvary. 14 K. - Plan of action for the 1st Calvary. 02 K. (1930 - Sc. #431) - Yellow Green. 05 K. (1930 - Sc. #432) - Light Brown. 10 K. (1930 - Sc. #433) - Olive Gray. 14 K. (1930 - Sc. #434) - Indigo & Red. 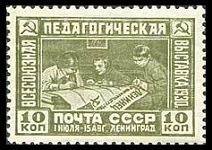 The 10 Kopeck denomination pictorial stamp shown above was issued on August 15, 1930 to publicize the Educational Exhibition, held in Leningrad from July 1 to August 15, 1930. The design features students preparing a newspaper. 10 K. (1930 - Sc. #435) - Olive Green. 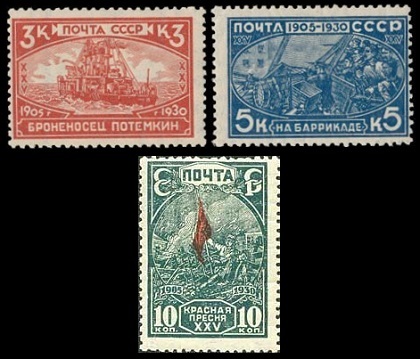 The three commemorative USSR stamps shown above were issued in 1930 and 1931 to celebrate the 25th Anniversary of the Revolution of 1905. 03 K. - Battleship Potemkin. 05 K. - Presnya barricade. 10 K. - Moscow barricades. 03 K. (1930 - Sc. #438) - Red. 05 K. (1930 - Sc. #439) - Blue. 10 K. (1930 - Sc. #440) - Dark Green & Red. 03 K. (1931 - Sc. #452) - Red. 05 K. (1931 - Sc. #453) - Blue. 10 K. (1931 - Sc. #454) - Dark Green & Red.